In the middle of a routine at home istighotsah Ustadz Sam Asriyanto Glagah Arum Village, Porong, Sidoarjo, East Java, pilgrims were struck by falling objects sound from the front room of his house. Once istighotsah finished, Sam Asriyanto check the origin of the sound to the room because it was calculated by falling objects or emerging new ground cracks because of the location of the house with the Lapindo mud embankment distance is only about 500 meters. Once the room is opened, Ustaz Sam surprised by the strange object. Black color, shape width and height. 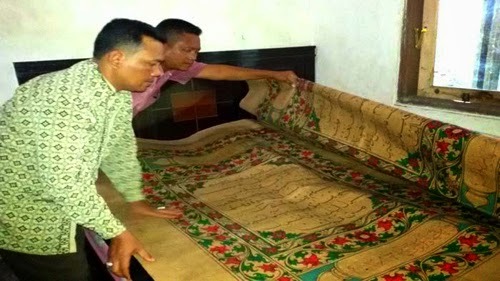 After scrutiny turns the object is a giant Koran. Room where the giant Koran was found that measuring approximately 3 x 3 meters. Until now the Koran with a black cover with three types of Arabic script is placed in bed sleeping (COTS). Inevitably, existing bed mattress bed was full. The smell of paper perfume Koran resembles that of the cloth covering the Kaaba (Kiswa). "A lot of people are saying like that, especially those who already perform (worship) pilgrimage," said Sam Asriyanto Ustaz. Koran giant suddenly found that, by Sam, who claimed to have become a taxi driver and a personal driver, was brought into the living room to be seen together with other pilgrims. Reporters Surya (TRIBUNnews.com Network) report, about 100 pilgrims istighotsah amazed by the gift, because the scripture that came as istighotsah. "Thank God, the contents of the Koran was the same as the content of the Qur'an in general both harokat and letters," he said. Sam alongside other istghotsah congregation, such as Nur Khanin, surprised by the Koran paper types. Brown paper that has not been found in the store paper or paper in general, especially aroma there. Similarly, the equipment used to write well is not known, whether markers or other stationery. "We know there are three differences in writing, because the shape of the letters are not the same," said Nur Khanin. The most interesting thing in the Koran it is on the home page that is Surah Al Fatihah. At the edge of the letter is full of red and green that makes the Koran increased elegant. "It's very nice," added Nur Khanin with awe. Ustaz Sam Asriyanto when asked before the invention of the Qur'an suddenly in front of her room, pleaded no premonition dreams or whatever. "Yes it's time Ustadz Nur Khanin direct invocation appears glodak voice. Yes his name supernatural stuff ya do not know where it came from. My room was also no roof," said Anand. As planned, the Qur'an will be kept at home students whose homes are large. Sam's own house size is approximately 8 x 20 meters, so if there are people who want to know it will be difficult.